Dong Quai (Angelica sinensis) prescribed for centuries by practitioners of Chinese medicine for balance, healthy menstruation and common PMS complaints. In addition, Chaste Tree Berry (Vitex agnus– castus) which according to recent clinical research is effective in reducing symptoms of PMS. To calm hormonal influences and purify the skin and blood, Organic Raspberry Leaf has been added it is recognized by German Commission E for menstrual respite. Juniper Berry and Organic Parsley Leaf ease water retention and promote mineral and hormonal steadiness, while Organic Chamomile Flower relaxes the mind and comforts the body. Yogic wisdom suggests women remain balanced, calm and nurture themselves during their monthly cycle. Let the herbal blend of Woman’s Moon Cycle help support you on your Moon Days. For best tea infusion, pour 8 oz boiling water over one organic Woman’s Moon Cycle tea bag and steep for 5 to 10 minutes. During the premenstrual week, drink 4–5 cups throughout the day. To build and balance hormones throughout the month, drink 1–2 cups per day as desired, or as recommended by a health care professional. 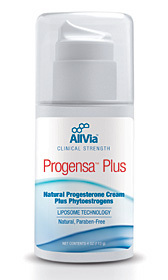 Bioidentical Progesterone with phytoestrogens,formulated to clinical strength, recommended by more holistic doctors than any other.